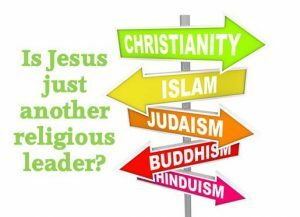 Jesus-Islam » His mission » Is Jesus Christ just a religious leader? Religion is at the centre of many social debates: comparisons between them, discussions on the benefits or evils religion produces, philosophical or political debates. For many people, religion is simply a set of rituals and beliefs that are meant to ease the conscience and give a sense of peace. Some are more serious and are looking for a link between themselves and God. They see religion as the means to that end. Jesus Christ is unique in this regard. He is called the Son of God, truly God and yet coming into the world as truly man. Yet, he did not start a religion. His claim was rather that He was the Messenger of the Father, the mediator having come to enable man to approach a holy and almighty God (John 1:18). He revealed God as “the Father”, not only of Him in a unique way, but also of all those who put their trust in Him. He revealed God with greater clarity than had ever been known before as the God of love (Bible, Injil, 1 John 4: 8). Jesus Christ, a perfect and sinless man, lived on earth in the midst of men, “He went about doing good and healing all who were oppressed by the devil, for God was with him.” (Bible, Injil, Acts 10:38). At the age of 33, he was put to death by wicked men. He died for us sinners (Bible, Injil, Romans 5: 8), but God raised him up (Bible, Injil, Acts 13:30). He is now alive, seated at the right hand of God (Bible, Injil, Mark 16:19). One day he will return and all who have accepted him as Lord and Saviour will be with Him forever. He will gather together what he calls his Church, composed of all those for whom he has given Himself as their sacrifice and Saviour when He died on the Cross. The Bible says, “And so we shall always be with the Lord” (Bible, Injil, 1 Thessalonians 4:17). Later will come the judgment that will fall upon this world. Then Jesus will appear, not as a leader of a religion, but as “Lord of lords and King of kings” (Bible, Injil, Revelation 17:14). And everyone will bow before him when they see Him as He is (Bible, Injil, Philippians 2: 10). Christ did not come to start a religion, but to mend a broken relationship. He came to reconcile us to God so that we could have a close and loving relationship with our Creator God, and know Him as our loving heavenly Father.